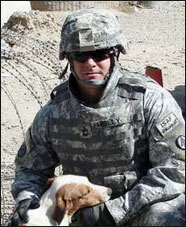 Army Sergeant First Class Troy Reilly joined the military in October in 1987 in New Orleans, Louisiana. His injuries didn’t occur in one specific incident, but rather throughout his deployment to Afghanistan. From the day his unit arrived, they took on sniper fire and were in close proximity to mortar and RPG attacks. During helicopter flights from FOB Shank to Bagram, the unit took on enemy fire from the mountain tops. While Reilly’s unit served at Camp Blackjack, mortars and RPGs caused heavy damage. Sergeant First Class Reilly, who spent nearly 20 years in the military, suffers from PTSD, recurrent major depression, panic disorder, and degenerative joint disease. Sergeant First Class Reilly received the Bronze Star Medal, Afghanistan Campaign Medal, Armed Forces Reserve Medal with 20-Year Device Silver, Army Commendation Medal (5x), Army Achievement Medal (5x), Meritorious Unit Commendation, Army Good Conduct Medal, National Defense Service Medal (2x), Global War on Terrorism Expeditionary Medal, Global War On Terrorism Service Medal, Non-Commissioned Officer Professional Development Ribbon, Army Service Ribbon, Overseas Service Ribbon (2x), and the Army Forces Reserve Medal with M Device. Building Homes for Heroes gifted Sergeant First Class Reilly and his children a home in Louisiana in 2015.